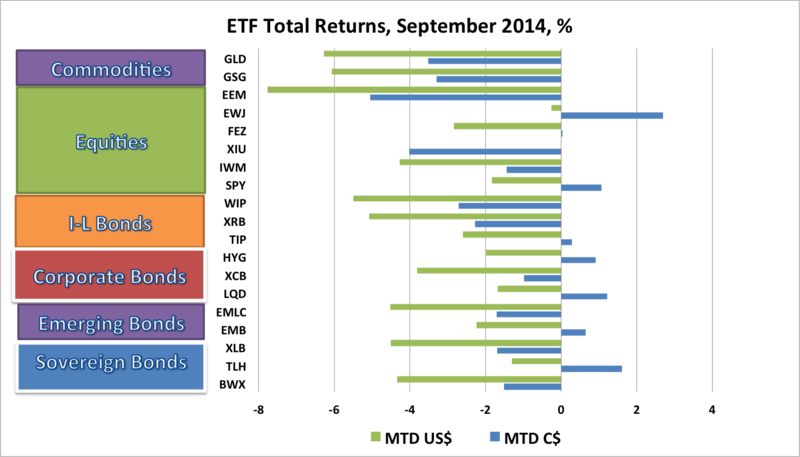 Every ETF we track in this blog lost ground in September in local currency terms. The US dollar strengthened against most major currencies, including a 3% monthly gain against the Canadian dollar. Global equity ETFs were weaker across all major markets. The bigger losses were in Emerging Markets, US small cap, and Canadian equities. Global government bond ETFs posted mixed returns, with long duration US and Canadian bond ETFs posting the best returns and Emerging Market Local Currency bonds posting the worst returns. Gold and commodity ETFs posted further sharp losses. Energy prices weakened further as the WTI crude oil futures price fell to $91/bbl at the end of September. US GDP growth for 2Q was revised up to 4.6%, but growth stalled in Europe and showed further signs of weakening in China. Global inflation moderated in August as energy and corn prices fell. Eurozone inflation remained stuck at 0.3%. Central banks continue to be on divergent paths, with the US Fed and BoE preparing markets for policy rate hikes within six to nine months while the ECB and BoJ remain under pressure to increase stimulus. The Bank of Canada remains neutral as to whether its next policy move will be a tightening or an easing and seems to be clearly signalling that it has no intention of tightening ahead of the Fed. The S&P500 closed September at 1972, down from a record-high of 2003 at the end of August, but was still up modestly from 1960 at the end of June. Global equity ETFs were uniformly lower in September. For Canadian investors with unhedged foreign equity exposures, however, the weakening of CAD turned some of these losses into gains. US Large Cap stocks (SPY) lost 1.8% in USD terms, but gained 1.1% in CAD terms. Japanese equities (EWJ) lost 0.3% in USD, but gained 2.6% in CAD terms. Eurozone equities wee down 2.8% in USD but flat in CAD terms. Other equity ETF losses were too large to be offset by currency movements. Canadian equites (XIU) lost 4.0%, while US small cap stocks and Emerging Market equities (EEM) lost 1.4% and 5.0% respectively in CAD terms. Commodity ETFs posted further sizeable losses. The Gold ETF (GLD) returned -3.5% in CAD terms, while the GSCI commodity ETF (GSG) returned -3.3%. Global bond ETFs posted mixed returns in CAD terms. ETFs with positive returns in September included the US long government bond (TLH), which was down 1.3% in USD but returned 1.6% in CAD, and USD-denominated Emerging Market bonds (EMB) which returned 0.7% in CAD terms. ETFs with negative returns included Canadian Long Government bonds (XLB), which posted a -1.7% return, EM Local Currency Bonds (EMLC), which returned -1.7% and Non-US government bonds (BWX) which lost 1.5% in CAD terms. Inflation-linked bonds (ILBs) also posted losses in September. US TIPs (TIP) lost 2.6% in USD terms, but gained 0.3% in CAD terms. Canadian RRBs (XRB) returned -2.3%, while Non-US ILBs (WIP) returned -2.7% in CAD terms. Corporate bonds were also mixed in September. US investment grade (LQD) and high yield (HYG) bonds lost ground in USD but returned 1.2% and 0.9% respectively, in CAD terms. Canadian corporate bonds (XCB) returned -1.0%. In the first nine months of 2014, with the Canadian dollar depreciating 4.6% against the US dollar, the best global ETF returns for Canadian investors in CAD terms were in US long-term bonds (TLH), US large cap stocks (SPY) and USD-denominated Emerging Market bonds (EMB). The worst returns were in commodities (GSG) and Eurozone equities (FEZ). Canadian equities, which were the top performers through August, finally succumbed to weak commodity prices in September. In global equities, the S&P500 ETF (SPY), returned 13.3% year-to-date (ytd) in CAD terms. The Canadian equity ETF (XIU) returned 11.9% ytd. US small caps (IWM), returned 6.0% ytd in CAD terms. Emerging Market equities (EEM), after a rough September, returned 5.5% ytd in CAD terms. The Japanese equity ETF (EWJ), after rebounding in September, returned 2.8% ytd in CAD terms. The Eurozone equity ETF (FEZ), which had been the top performer through May, continued to suffer from geopolitical tensions and EUR weakness and returned 1.3% ytd in CAD terms. Commodity ETFs had lackluster performances this summer after strong starts to the year, dragging down year-to-date returns. 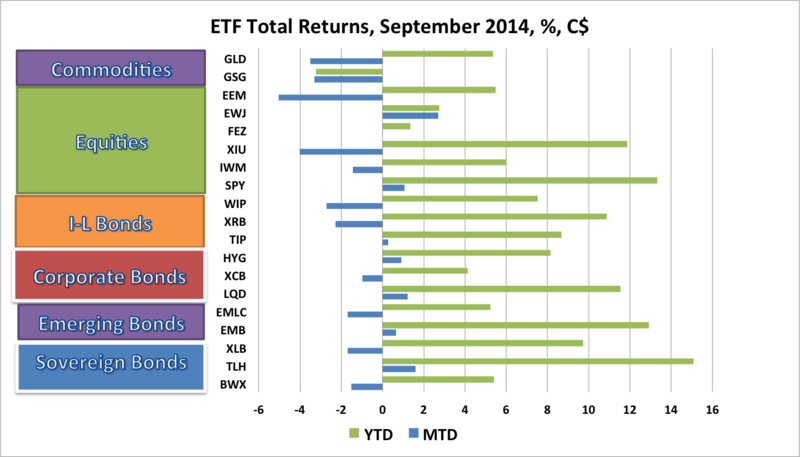 The Gold ETF (GLD) has returned 5.4% ytd in CAD terms, while the GSCI commodity ETF (GSG) returned -3.2%. Global Bond ETFs lost some of their lustre in September. Foreign bond ETFs have benefited from a combination of weaker than expected global growth, weakening commodity prices, safe haven demand and accommodative central bank policies. The US long bond ETF (TLH) returned 15.1% ytd in CAD terms. USD-denominated Emerging Market bonds (EMB) returned 12.9% ytd in CAD terms. The Canada Long Bond ETF (XLB) posted a gain of 9.7% ytd. Non-US global government bonds (BWX) posted a return of 5.4% ytd. Emerging Market local currency bonds (EMLC) suffered from EM currency weakness to return 5.2% in CAD terms. Inflation-linked bonds (ILBs) weakened in September but continued to turn in strong year-to-date gains after a disastrous performance in 2013. The Canadian real return bond ETF (XRB) has benefitted from its long duration, returning 10.9% ytd. US TIPs (TIP) returned 8.7% in CAD terms, while Non-US ILBs (WIP) returned 7.5% in CAD terms. In corporate bonds, the US investment grade bond ETF (LQD) returned 11.5% ytd in CAD terms, while the US high yield bond ETF (HYG) posted a return of 8.1% as high yield spreads widened. The Canadian corporate bond ETF (XCB) returned 4.1%. In September, the Global ETF portfolios tracked in this blog posted losses, trimming their year-to-date gains, which have been boosted substantially by the weakness of the Canadian dollar. 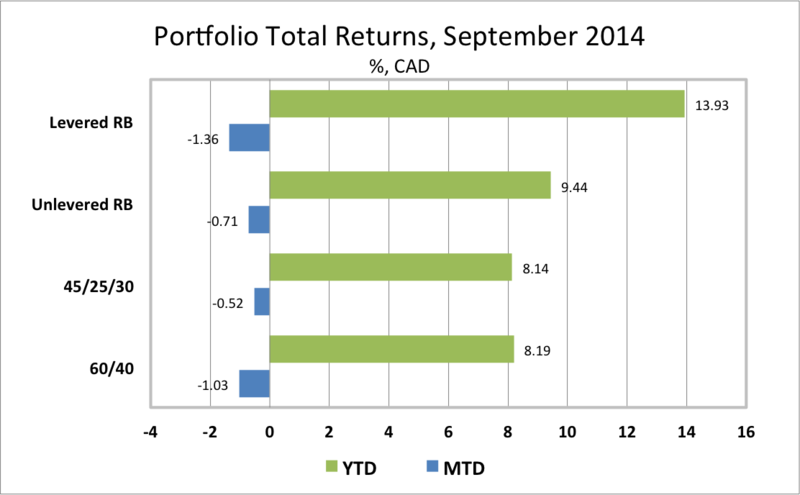 The traditional Canadian 60% Equity/40% Bond ETF Portfolio lost 103 basis points in September to be up 8.2% ytd. A less volatile portfolio for cautious investors, comprised of 45% global equities, 25% government and corporate bonds and 30% cash, lost just 52 bps to be up 8.1% ytd. Risk balanced portfolios also posted losses. A Levered Global Risk Balanced (RB) Portfolio, which uses leverage to balance the expected risk contribution from the Global Market ETFs, lost 136 bps in September, but was still up an impressive 13.9% ytd. An Unlevered Global Risk Balanced (RB) Portfolio, which has less exposure to government bonds, ILBs and commodities but more exposure to corporate credit and emerging market bonds, returned 71 bps in August to be up 9.4% ytd. US labor market developments remain a key focus. FOMC members have begun to prepare markets for increases in the Fed Funds rate in 2015. QE is ending and a "normalization" of the policy rate is expected to follow. I wrote about "Exit Ennui" in mid-September (see here). While US employment growth remains relatively strong and US real GDP growth remains solid, growth in Europe is stagnant and growth in China appears to be weakening. This is likely to create tension within the FOMC as hawks focus on US relative strength while doves give more weight to moderate inflation and weakness outside the US. This divergence is pushing the USD higher against all currencies and potentially weakening S&P500 earnings for those companies with significant foreign operations. US dollar strength will continue to be fuelled by safe haven flows and by the divergent monetary policy paths being taken by the Fed and the BoE toward tightening and the ECB and BoJ toward maintaining or increasing monetary ease. The Bank of Canada will find ample reason to remain neutral on the direction of the next policy rate move. Canada's real GDP began 3Q on a softer trajectory and the terms of trade continue to weaken. Further weakening of the Canadian dollar will be tolerated. The debate between US equity bulls, who favor buying every dip, and those advising caution due to high equity valuations (see here) continues. After moderating over the summer, global disinflation concerns reemerged in September. Weaker growth in the Eurozone, Japan and China, falling crude oil and corn prices, in the dampening effect of geopolitical tensions on consumer confidence all add to global disinflationary pressures. The risk of a global deflationary shock still seems much greater than the risk of an inflationary shock. As it turned out, the ample cash cushioned losses in my desired portfolio in September. Both bond and equity prices corrected in September, but these corrections made only a slight dent in asset overvaluation (see here). What was interesting in September was that bonds led the sell-off through the first three weeks, but equities experienced bigger losses by the end of the month. The unstable equilibrium is nowhere near corrected. Prudence continues to favor an ample cash allocation.